Adds over 50 new voiced lines by StrayKitten to fix the NPC as a settler. Unlocks some hidden game content in Vault 81. Allows you to recruit Tina outside Dependency even after the quest was already finished... or bugged out. - remastered audio - thanks to Fatalmasterpiece for the help! Fixed the weird rotated eye glitch. Ever since I created the patch called Dependency Quest Fix back in April, I wanted to add new voice to Tina in the game. 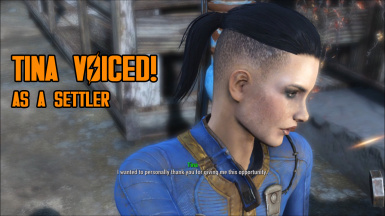 Tina De Luca Voiced as a Settler is a mod that gives over 50 new voiced lines to the character after you recruited her as a settler as a reward at the end of the Vault 81 quest Dependency. The new voice parts were necessary due to the lack of actual voice data and settlement dialogue for her in the vanilla game. The mod also revisits Dependency in a way many people requested over the last 7 months. It gives you the opportunity to recruit Tina outside the quest which means you can talk to her any number of times and try to convince her to become a settler regardless of the outcome of the quest. After you finally convinced her you can send her to any of your settlements, and as soon as she arrives, the new settlement related dialogue trees with her will be unlocked. WATCH MY VIDEO FOR FURTHER DETAILS! Enable TinaDeLucaSettlerVoiced.esp using a mod manager or manually. If you have never finished the quest called Dependency in Vault 81, just play the game, and you will find no problems recruiting Tina De Luca regardless of the outcome of the quest. The mod will allow you to retry recruiting her any number of times. If you've already finished the quest, and failed to recruit her, just talk to her again after you've installed the mod. If she's already on your settlement, you finally will be able to talk to her. This mod is 100% compatible with Dependency Quest Fix and the Unofficial Fallout 4 Patch because it makes the same edit regarding how it fixes the game. It also outdates my earlier mod Dependency Quest Fix. The mod is compatible with any other mods that change the appearance of Tina De Luca since it never touches the NPC record. The mod edits some vanilla game data which are probably not edited by any other mods. Keep the mod high in your load order just in case you have other mods that would edit Vault 81 dialogue quests. This mod will still work if other mods override its edits. Tina De Luca is voiced by StrayKitten as a settler. She is the same voice actress who made a wonderful job voicing Tiny Tina (from Borderlands 2) in DDProduction83's Tinas Cookiepocolypse. Originally Tina De Luca and Tiny Tina are both voiced by the same voice actress, Ashly Burch. If you don't want Tina to quit her job being a chem dealer but rather want to go full Heisenberg with her check out MunkySpunk's awesome mod with very colorful and high quality outfits for Ms. De Luca along with face and body presets!